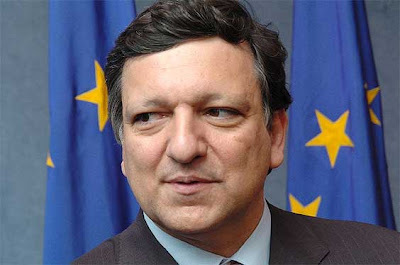 BRUSSELS, Belgium -- President of the European Commission Jose Manuel Barroso has confirmed the EU's intention to approve at the EU-Ukraine summit on November 22 an action plan for Ukraine towards the establishment of a visa-free regime, according to a statement released by the EU with a view to the upcoming summit. "Ukraine is a key partner for the EU and an important regional player. The ambitious agenda of this Summit reflects our dynamic and intense relationship. I am pleased that we will agree on an action plan towards the establishment of a visa-free regime for Ukraine and on a protocol that gives Ukraine access to EU programs," he said, while announcing the forthcoming EU-Ukraine summit. Barroso said that "these are two concrete examples of the EU's continued engagement with Ukraine." The European Commission said that during the summit "the leaders will discuss the next steps in the visa dialog aiming at establishing a visa-free regime for short stay travel as a long-term perspective." Barroso said that during the upcoming summit the sides would "also take stock of the progress in the negotiations on the EU-Ukraine Association Agreement, which we want to complete as soon as possible." "We will stress the need to further improve the reforms' process, in particular in the area of rule of law, but also the business and investment climate," he said. President of the European Council Herman Van Rompuy, in turn, said that this was the first summit since Ukrainian President Viktor Yanukovych had been elected earlier this year, but "overall this is going to be my fourth meeting with the president in one year." "Reform in Ukraine and the EU-Ukraine bilateral relationship will be at the top of the agenda. We will welcome the positive steps taken by Ukraine particularly in the economic and energy sphere. We look to Ukraine's leadership to increase the reform momentum in these areas and as regards respect for human rights, the rule of law and democratic principles," he said. The European Commission also said that the EU leaders would call on Ukraine to give renewed impetus to reform efforts, in particular, as regards the consolidation of human rights, democratic principles and the rule of law. "They will urge Ukraine to make further progress in improving the business and investment climate, particularly by tackling corruption and removing red-tape. They will also welcome reforms in the macro-economic sphere, particularly in the light of Ukraine's Stand-By Arrangement with the IMF. They will look forward to Ukraine's imminent accession to the Energy Community. In the energy sector they will review progress in the implementation of the Memorandum of Understanding on Energy Cooperation, as well as the modernization of Ukraine's gas transit system," reads the statement. The summit will provide the leaders with the opportunity to discuss EU-Ukraine relations, including progress in the negotiations of the EU-Ukraine Association Agreement. The leaders will review the reform agenda including respect for common values such as human rights, democratic principles and the rule of law. The agenda will include sectoral cooperation in areas as diverse as energy, transport and justice, liberty and security. International issues that will be addressed at the summit include relations with Belarus, Moldova, including the settlement of the Transdniestrian conflict, as well as relations with Russia. The summit will be hosted by Van Rompuy. The European Commission will be represented by Barroso, EU High Representative for Foreign Affairs and Security Policy Catherine Ashton, Commissioner for Enlargement and European Neighborhood Policy Stefan Fule, and Commissioner for Trade Karel de Gucht. The Ukrainian side will be represented by Yanukovych and Foreign Minister Kostiantyn Hryschenko.